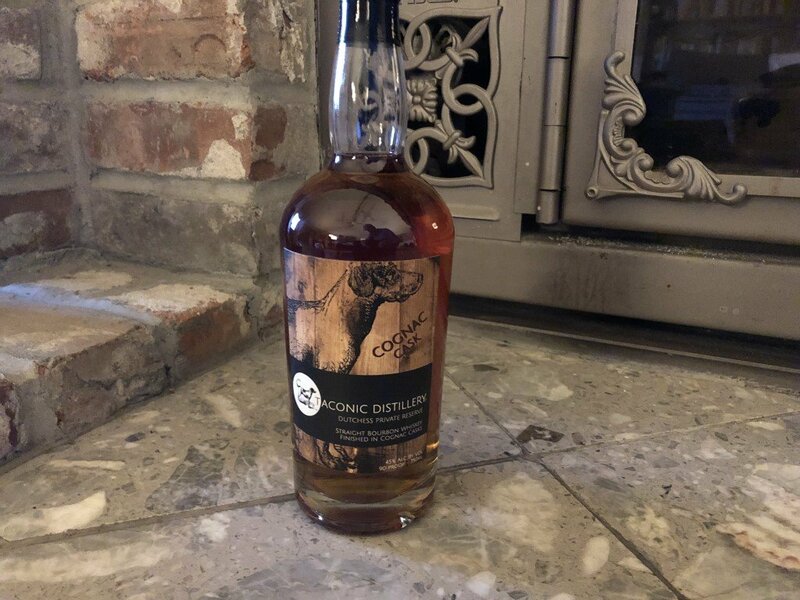 New York-based Taconic Distillery (formerly known as Millbrook Distillery) was established in 2013, but it’s already winning praise for its homegrown whiskey, including this bourbon, a whiskey (reportedly 70% corn, 25% rye, and 5% barley) that spends 3 1/2 years in its original new oak cask (no size noted), then another 6 months in a full-sized Remy Martin Cognac cask. For a six-year-old distillery to already be experimenting with finishing casks is pretty impressive. While I haven’t tasted the outfit’s standard editions, I was excited to give this more limited release a try. Let’s give it a spin. While I was expecting a rather burly, undeveloped whiskey, Taconic’s Cognac Cask finished bourbon is surprisingly fully formed. The nose is very sweet (with just a slight astringency to it), a load of butterscotch, toffee, orange peel, and some light raisin notes that hint further at the Cognac finishing. The palate is aggressive with that butterscotch character, pouring on notes of orange, maple syrup, and caramel sauce, making for one of the sweetest bourbons I’ve encountered in recent memory. There’s a simple, classic barrel char note on the back end, which leads you to the finish, though overall this is sweet (with a light raisin reprise), and fairly short. All told it’s a rather pretty whiskey that breaks expectations for craft bourbon, and while it’s not overwhelmingly complex, it is nonetheless plenty engaging and quite enjoyable. Is this actually distilled by them? I was pretty sure it was sourced which might explain it’s lack of ‘craft bourbon’ flavor. Taconic does all its own distilling in a Vendome continuous column still with a doubler, per the company. The distillery is right down the street from me in Dutchess County.